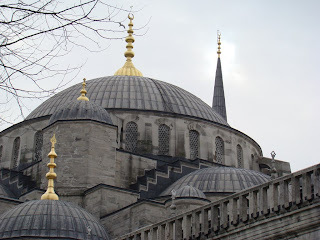 As we strolled through the neighbourhood of Hagia Sophia, in central Istanbul we were attempted hijacked into every restaurant on our way, except one. That was Adonin Café & Restaurant, and that was place we went to eat. We did not regret it. Adonin Café & Restaurant is located in Ticarethane sokak, a quiet side street to Divan Yolu Caddesi, in central Sultanahmet , a busy city street leading up towards to the city's Grand Bazaar. 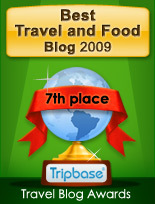 The restaurant is close to the main attractions as the Hagia Sophia, Blue Mosque, and the Cisterns. This quiet narrow street is a far cry from the busy life in the main street. Here you may eat outside or do as we did, enjoy an indoor lunch. 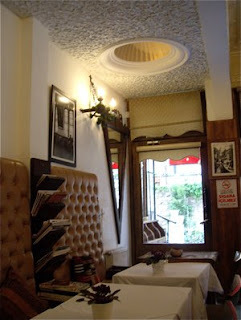 The interior was not typically Turkish (or whatever that may be), but rather resembled that found in an Italian restaurant. It was an elegant room with cream and white coloured walls and dark wood details, a grand bar desk in wood with wrought iron details, chairs in dark wood and sofas covered with coffee coloured leather. We were comfortable seated by a table, with a white table cloth. Two seats were on a soft leather sofa, and I was seated in a comfortable chair. It was a spacious restaurant, that would not feel over crowded, even if full. Very good service, bordering to be a little pushy, in my mind, as they slightly over sold the restaurant, and that was absolutely not necessary. We were given a good English menu, so we knew what we were picking out. We were served our drinks but waited a little for our food. I chose the Hünkar Begendi, a dish with eggplant with a bechamel base topped with succulent lamb or chicken sautéed in olive oil. It was a delicious dish. On a base of white sauce mixed with eggplant, another layer of gravy covering large chunks of chicken. It was garnished with fried tomatoes and green peppers. Interesting with two layers of sauce. The bechamel was extremely smooth and rich, and a mild contrast to the spicy and well balanced gravy. The chicken was extremely tender. 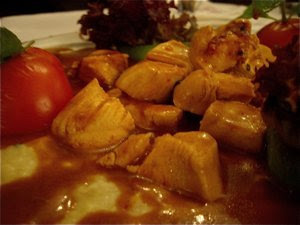 This dish was, all in all, of the best the Turkish cuisine can offer. 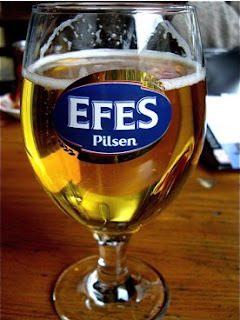 I decided to order a glass of Efes beer, the locally produced beer, a refreshing and much cheaper alternative to red wine, which would have been the most obvious choice to this dish. It is a Pilsener type, a full-bodied lager, rich in foam, and well balanced slightly sweet malt and fruit aromas. 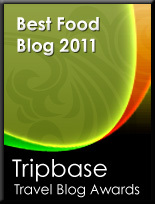 Good, well balanced, and inexpensive food. A good choice in central Sultanahmet district.